We promised you a long time ago that we will incorporate in Kontent Machine the ability to use locally saved files. It has been on 60% since… forever. The truth is that in our attempts to include all feature requests from our clients we left it at 60%. We stopped developing it until we were harshly woken up on BlackHatWorld… and we thank you for that! 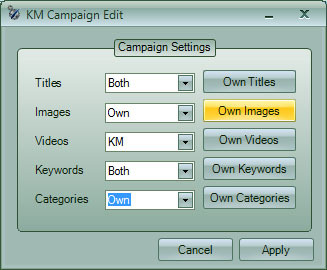 – Ability to use locally saved files to build your campaigns. You can do that with or without the relevancy checking algorithm. – Ability to use both scraping AND locally saved files to build your campaigns. – Upgraded content generation algorithm. Now it is not only faster but it can work with keywords that it didn’t find enough content for before. It means – even more content. – Ability to use your own lists of image and video URLs. Kontent Machine IS the premium content generation software out there and we are committed to being one step ahead of the competition – ALWAYS! 2. We will start a series of Kontent Machine tutorials walking you through all possible scenarios. We will be releasing them once a week. If you have any ideas on what you want them to be about let us know by on BlackHatWorld or via email/ticket. 3. We will reset ALL EXPIRED ACCOUNTS! We know that one of the major reasons people were not happy with the software is that it was not getting enough content so now EVERYBODY who used the trial and didn’t continue will have the chance to test the new version for 7 days again. Once again – thank you for helping us set our priorities right! We needed it. We are also wrapping up the “about me” creator which will give you literally THOUSANDS of author bio variations. We have put a lot of focus on it to make it unlike any similar software out there… and we have!